I have to admit I had never heard of this movie until reading the announcement of Twilight Time’s month of May releases, or at least simply over looked it in the past. I find it truly an insult to myself in thinking this film slipped by me. I am a movie buff and something I take pride in is knowing a lot about cinema. That is what I do, research, talk, write, review and love film. Shame on me for not knowing this film because it is truly a powerful drama with romance, and also the aspects of war. This is an emotional powerful acted film. Directed in a flawless way that makes you remember it from beginning to end. There is an emotional roller-coaster in this film. The acting by Robert Carlyle and Oyanka Cabezas is really something that stands out as being passionate, and utterly fantastic in the art-form of performing on screen. Directed by Ken Loach and written by Paul Laverty. Loach crafted an excellence in this film. He was able to harness an ease with the storyline, yet created the emotional ordeal on screen that leaves you in a total state of just how great a film director he is. I think Loach has never really gotten the praise he deserves. That is another thing that shocks me, because I love Ken Loach as a director, and yet I hadn’t seen, or heard of this movie. He directed and created some the greats of cinema. His 1969 film Kes, is a flawless example of his brilliance. His ability to capture amazing story’s and acting is always a treat that unfolds for the viewer. From 1967’s Poor Cow to 2006’s The Wind that Shakes the Barley, and many others showcase his ultimate expertise if crafting memorable films. 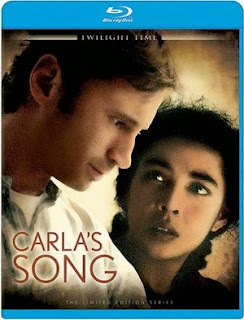 Carla’s Song is one of those memorable films. Now the writer Paul Laverty is an interesting character in that he is a Lawyer turned script writer, and has had a long partnership in film making with Ken Loach. Carla’s Song is his first script to be made into a film by Loach. Loach would go on to create 12 more films written by Laverty. Both equal a dynamic duo of film perfection. One imaginative story teller, the other a powerhouse behind the lens of the camera. Carla’s Song is a wonderfully written story by Laverty. Ken Loach understood that power, and saw that in the script form and created this wonderful film of emotional drama. Now I think the most shocking reality to this film is that your main female lead, Oyanka Cabezas had never acted before. This was her first acting role, and what I can tell, her only acting role. Shocking because she was brilliant in this film. She plays the character of Carla, breathtaking accurate. Also starring the amazing Robert Carlyle. Carlyle is a constant performer, that is a true sense in the term acting. He is able to express, and most of all become the parts he plays. He has acted in some of my favorite films, 1994’s Priest, 1996’s Trainspotting, 1997’s The Full Monty, and many important others. He is a fantastic actor to experience in many of his films, and his performance in Carla’s Song is not different. Carla is a Nicaraguan woman who lives in exile in Glasgow Scotland. She is searching for her past. Her family and boyfriend are back in her home Country of Nicaragua. Now living in Glasgow, she meets George who is a bus driver. There he and she head back to the War Torn home of Nicaragua to find her past. The time is 1987 and the place is in a total chaos in the form of war. There the chemistry and relationship between George and Carla grow on screen. A fantastic example of story, imagery and drama. What also needs to be mentioned is the cinematography by Barry Ackroyd. I don’t know how to put into words, the wonderment of the cinematography, other than flawless. Ackroyd is a stable on many films with director Ken Loach. Carla’s song is a fine example of the art-form of cinematography at its finest. Twilight Time blu-ray saw the power and the passion of this film. They have created a wonderful and flawless transfer of this film on Blu-ray. A wonderful product of high quality sound, imagery, special features. Twilight Time always amazes me in interesting choices to release on Blu-ray, and Carla’s Song is no different. Nothing wrong in this department. Simply put, beautiful, vibrant in color even with it's nightmarish war reality. Sound is crisp. Both audio and video stands out as being brilliantly weaved together on this Blu-ray. Isolated music and effects track. This is a wonderful special feature because the extraordinary music score is by George Fenton. Fenton is ear candy. His style and ability to bring emotions and important reality to key moments in films both small and large. Carla’s Song is that prime example of how to create memorable music in film. He to, like many persons creating this film, has been a stable with Ken Loach cinema. George Fenton has been responsible for music in many of my favorite films such as 1984's The Company of Wolves, 1988’s Dangerous Liaisons, 1991’s The Fisher King, and many more. This is a wonderful special feature to listen to his music. A treat for any music lover, or movie soundtrack lover. Audio Commentary with Director Ken Loach and screenwriter Paul Laverty. This is a fascinating listen. I loved hearing both director and writer tell about the film in great detail. A wonderful cinema lover’s treat to hear the director talk about his work. Highly priceless. Deleted Scenes. A great special feature, and always a treat to see moments removed from the film. You also get the very important small booklet insert by Film Historian Julia Kirgo. Twilight Time seems to always amaze me picking some of the films they choose to release on Blu-ray. I was super excited to see this for the first time in a high quality transfer and sound excellence. This is a great Blu-ray, and is a great film to me, I highly recommend this Blu-ray of this important drama piece.